Guide to fertilizing, over-seeding and winterizing your lawn! Fluegel’s has the products and supplies you need to keep your lawn healthy and beautiful. There is still time to apply our third and fourth step fertilizers to finish off the season and ensure a lush green lawn next summer. The first application should be applied after you have mowed your lawn in the spring. 21-0-10 with Dimension is a fertilizer that contains a crabgrass and annual weed pre-emergent. A 40lb bag will cover up to 11,111 square feet. The second application should be applied between June 15th and July 1st. 25-0-14 with Trimec is a fertilizer with a broad-leaf post-emergent. The weed killer in this product will work when the weed are up and actively growing. A 40lb bag will cover up to 10,000 square feet. The third application should be applied between the end of August and September 15th. 25-0-15 is a slow-releasing fertilizer that contains sulfur and iron to help keep the green in your lawn. A 40 lb bag will cover up to 10,000 square feet. The last step is applied sometime late in October or after and before the snow starts to fly. 20-0-10 is a lawn thickener to feed the roots of your lawn. A 50 lb bag will cover up to 10,000 square feet. During fall and winter months in Minnesota, the grubs of the Japanese Beetle burrow into the soil 4- 10 inches deep where they live until spring approaches. As the temperatures begin to warm, the JB grubs move towards the surface and start eating the tender roots of the grass which can cause brown patches and irreversible turf damage unless treated. 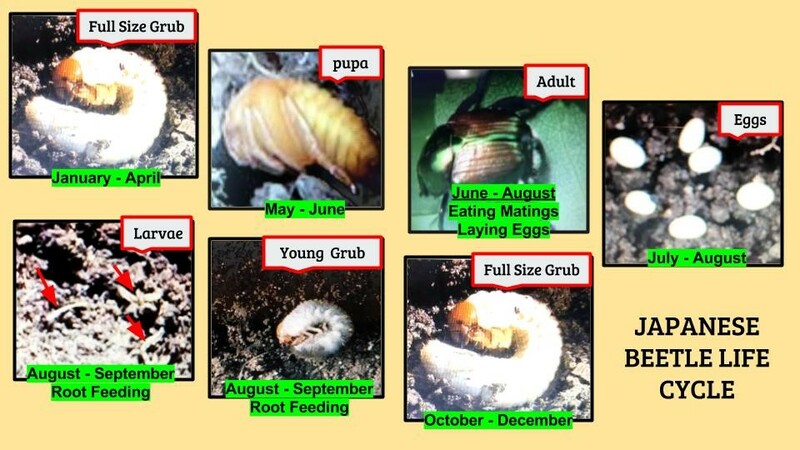 Around May and June, the JB grubs enter a pupae stage and then emerge as a beetle with an intense appetite. The JB adults eat and mate during the day and the females lay eggs in the ground at night. The new larvae hatch and start eating the tender grass roots before burrowing down deep in the soil to winter. In spring, the cycle begins again. We have many products to help your effort in battling the Japanese Beetle. Early spring is the right time to use a granular product to eradicate the grubs from your lawn. Although this will help save your lawn, it doesn't necessarily prevent the adult beetles from aggregating on your garden plants and trees. When Japanese Beetles start to visit your yard, we can help. We have sprays and concentrates that when applied to foliage and ingested by the beetles, will kill them. If you have a major infestation on roses for example, we have a spray that kills on contact. Lure traps are an added alternative to keep the beetles in check. Products by Sevin are also sold here!